Hello Sweeties♥ Is me again! I guess some of you already noticed this new gadget on my instagram. Yeap, the new Fujifilm SQ10 polaroid camera that allow you to capture the 1x1 square format instax polaroid photo. What really caught my attention was the new hybrid instant camera feature. It's exactly works like a normal camera where you can see the photo you took on the screen of this camera and at the same time pick whatever photo you took & print it right away... on the spot! This is not a paid advertorial and I did not get paid for positive review but for those who followed me since years ago you probably know I'm the instax , polaroid lover. Ever since I bought my first instax camera 7s since 7 years ago, I'm really addicted with it. Now it's instax polaroid photo everywhere in my new studio apartment, the place where I spent most of my time working and get inspiration. I even blog about how I did the instax polaroid + grid rack here (http://www.chanwon.com/2017/02/diy-instax-polaroid-grid-rack.html). Until now my first instax camera 7s was still my precious baby because it captured every important moments in my life and instantly print it out. Remember that was my first instax camera and I use it to selfie with Smelly and we keep it in our wallet. That happened on our first anniversary when we were just 18. Then 5 years later I got a little pinkish, which is the mini8 that was really cute and tiny to bring it around when I'm traveling to my favorite country, Japan. Now, with the latest technology Fujifilm even came out with the latest SQ10 that able to add filter, edit and take a look on the photo on the camera screen itself before printing your Instax out from the camera. These will capture my moments as if time has stopped for eternity. I'm blessed and grateful for everything happened in my life. So let me introduce my new baby black SQ10!! 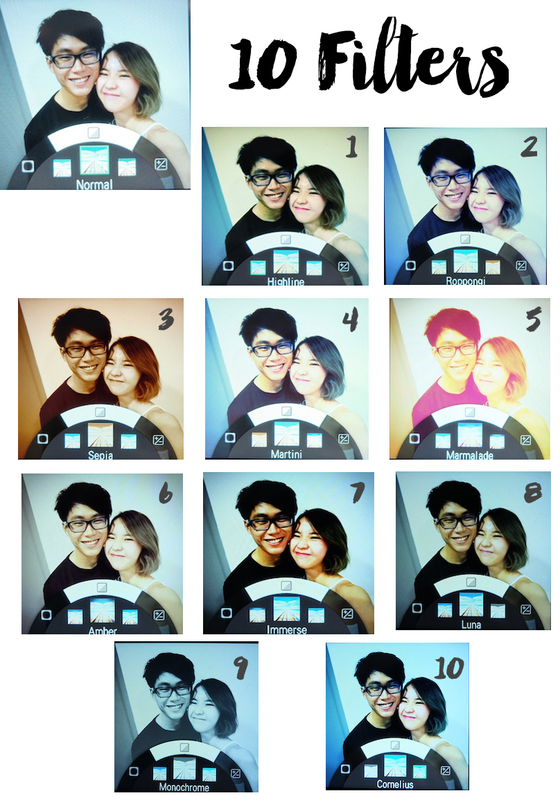 There are only one color available for SQ10 and the few highlights which distinguish it with other instax camera was the 1x1 Square format (like instagram square photo) , added 10 new filters and the LCD monitor screen! It is the first hybrid camera within its range equipped with a digital image sensor and digital image processing technology, enabling greatly improved photographic image quality and image editing/processing before printing. What make it really diff was the new dual shutter button that suitable for right and left handed user and one of the button can me customised it with your favourite shortcut button. This baby black SQ10 has an iconic design and a thin, round, symmetrical shape for easy holding. The lens ring is made with metallic finish and the solid black body has a sense of depth and variety throughout the solid black body. It's user friendly with a big LCD monitor screen on the back of the body and some easy symbol buttons for you to add on different filters, vignette control and brightness adjustment. The best thing was all operations throughout shooting, editing/processing and printing are displayed on the LCD screen. Also some quick button allows you to go back , play the photo and look back to pick the one and a button for you to print it out. This is particularly useful when you wish to pick the best photo you took on this camera and added with filter. Next, you can print it as many as you want and share those wonderful moment with your friends too. The on and off button is located between two of the dual shutter button. Can easily turn it on and off + quickly with only one hand needed! One of the main highlight was the 10x filters that available build in with this SQ10. It's must favourite and let me show you the exact photo before the filter and after applied the 10x filters. My all time favourite filter will be roppongi , martini , luna and cornelius. I think this should be one of the travel companion for my coming trip because previously when I carry my mini8 I need to retake few shot to get the perfect one but this one after taking the photo I still can choose and edit the filter then only choose to print it + print as much as I want. Next will be the vignette control. It works like the instagram filter where you can easily adjust the amount of vignette you need. There are a min & max amount of it and you can adjust the setting according your mood and preference. Awesome right? Now we can create more work with this instax camera SQ10. Also, another added value feature will be the brightness adjustment. You no need to use your phone to adjust and afraid if it's under or over exposed. Everything can be done in few second. Just take a shot and edit / adjust the brightness right away with the control button. OMG!!!! This totally win my heart! The selling price is the Instax Square SQ10 will be RM1328 and one box of 1x1 square film will be RM48. Everything comes with a cost. So here's a little summary review about this Fujifilm SQ10. Pros: Square film, Filters, brightness adjustment, vignette control, user friendly, images taken and edited/processed can be saved in the internal memory (up to about 50) or microSD card slot, user friendly, LCD monitor screen, allows creativity, auto/ manual mode. Although some of you might think it's a little out of your budget because the price is higher than the normal instax camera , but let me tell you something...It's worth for its value if you compare with the endless shot in order to get a perfect selfie and wasted so many film for just a perfect shot. So personally if you really love polaroid and love instagram 1x1 square format then this is definitely the one for you! I received lots of your question about which is the best between instax mini9 , SQ10 or instax printer. Which should buy!?! Actually it's all depend on what kind of person you are, what you prefer and what you need. But the main diff is the size of the film and also the new SQ10 has the LCD Monitor + filters and straight edit and process right away before print it out from the camera. For the printer you need to connect with your phone and no filter can be added unless you edit it yourself on your phone before print it out while the normal instax camera is just like the what we have now. Just shoot and it will automatically print it right away you press on the shutter. Mean you can't choose what to print and you might waste some of the film on it but it's more affordable ya. So for my advice if you are quite budget or still a student or don't have any instax camera before, you could go ahead to try the normal instax camera (like the new one will be Instax mini9 which has a selfie mirror on the front). If you love to create more , love to travel, and play around with new filter and prefer a square film 1x1 format like our instagram square photo then I think you don't mind to get the new SQ10 because it's really AWESOME!! Totally changed the concept of the instax camera to a brand new creativity instax camera. Also , for people who own a unit of normal instax camera I think you should try the 1x1 SQ10 because trust me...it's fun and nice! I get to choose what I want before I print and add with my favourite filter too. For me I love to bring SQ10 to travel because it's so easy and I think it give my trip a good and memorable memories. Lastly, if you just love the polaroid film and you want to have a choice of choosing your favourite photo but cant afford the SQ10 or you prefer the normal instax film than the 1x1 format then you could just go for the printer. Normally for people who always use camera to shoot photo, they might prefer the printer itself than the instax camera. So hopefully all my advices and recommendation can solve your problem and welcome to the instax Fujifilm family!! A big hug for all of you and I love each of these camera because it captured my moments as if time has stopped for eternity. So it's all about my review + thoughts on this new Fujifilm SQ10. Thanks for reading my blog and I hope this is useful for you! That's all for today and I will see you on my next post. Love, xoxo. waited for this blog post of yours for so long, finally came out d! !